Oh what a wonderful wintry set of days this has been! Entirely not like the week we had originally planned. The original plan included a grand Solstice Celebration last weekend at the new Taproot Portland space, but that was postponed (until January 6th) due to the weather that day (so much snow! and ice!). And on Christmas Day, we always go to my family's gathering an hour south, but that too was cancelled due to another dumping of snow that left us quite "stuck" at home. All of which meant that we were home a whole lot more than originally anticipated. Home! All together under one roof! With nowhere to go! In pajamas all day! Oh goodness, it was delightful. Pop's back at work today and I'm doing a little bit too, but we're still lingering a bit in the slowness of this in between week, and anticipating another extra long weekend coming up. Aside from all that snow (all that snow! I've lost my older boys to the mountain for good now), we're dealing with some rather cold temperatures here this week. It did go above freezing this morning for just a bit and I snuck out to feed the animals and tuck them into extra warmth. It's going to be a chilly stretch here....just right for more home, and cozy, and family. And oh, some knitting to be sure as well! It's been a busy autumn for me, and I'm just so glad for this little reprieve and chance to catch my breath in the warmth of home and my people. I hope you and yours are enjoying these days too! The last day for holiday shipping is 12/20! Yes, please! My kids are growing out of their urban baby bonnets, and we need to size up! Makers Market today in Portland! Today at the Taproot Market in Portland! So many lovely treasures for gifting! Join us from 9-3 on Cove Street! Oh this little one of mine, Adelaide. Not so little really, being twelve now and all. Twelve, can you believe it? I know some of you have been here reading since before she was born and that's just wild isn't it? I like to worry about my little ones, it's a favorite hobby of moms everywhere, I know. Have I served them well? Have I done right by them? Are the choices we've made for them the ones that their adult selves will be happy with? And what about that terrible penmanship - should I worry about that? Ha! It's a never ending list of possible worries, motherhood is. Which is why I'm always grateful for those illuminating moments when I'm reminded that yes, perhaps the penmanship could use some work, and maybe someday they'll have wished we made this or that choice differently, but for the most part? They're going to be just fine! That the young human beings I'm seeing in front of me are going to be a-ok in the world. The younger kids are home with a nanny and tutor three days a week now while I head into town for Taproot work. It's a juggle of passions - for hearth and home, and community and the work I love and that sustains us. But of course - that juggling certainly has its own opportunity for worry. Yesterday, Adelaide joined me in Portland for a long day of work, and goodness gracious, I had one of those wonderful gifts of a parenting moment that lasted all day long, reminding me that all is well, it really is. And I can cross a few things off my worry list (penmanship stays). After lugging a bale of hay to the sheep (she's crazy strong from years of that! ), she went back inside and put herself together for a day in town. An adorable outfit later ("black" is the color of the year) because these things matter to her greatly these days, and a teeny tiny touch of Mama-approved makeup (we love Living Libations! ), she was ready to go. And a day of in-town play and work for her commenced, and I got to marvel at this little girl of mine. She bounced happily between tidying for me and straightening the shop, baking in the kitchen with Lauren, and then totally rocking out the evening prep for our Herbs & Crafts night, fussing about all the little things that I usually fuss about. At the end of the day, I was the one tired and asking to go home, while she was still giggling with all the adult women who surrounded us - amazing herbalists, and dear friends, and farmers and artists and business women, and gah! I got a bit choked up there thinking about all of that. About what a gift it is to have 'aunties' like that in your life at that delicate age, remembering the women who so greatly influenced me in those years. Gentle, powerful women moving through the world with such grace and strength. What a gift. LüSa Organics has been handcrafting organic, herbal body care since 2002. We specialize in herb-infused balms, moisturizing soaps, nourishing oils, and sublime scents - among other delights! We offer products for a wide range of ages, skincare needs, and budgets. Our goal at LüSa is to make healthy, sustainable body care affordable to nearly everyone. With that in mind we offer our soaps naked (sans packaging) or in a 100% post-consumer recycled box and also sell our scratch-and-dent soaps by the pound for those seeking an even greater bargain. We offer refills for some products, which are both easy on the environment and your wallet. And everything we make is unconditionally guaranteed. We think you should love it more than anything you’ve used before, or we’ll take it back - we promise! That makes trying new products risk-free, fun, and easy. 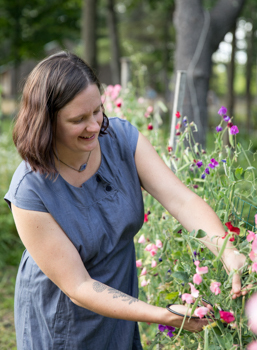 At the heart of our business is our family: Rachel (that's me), Pete, Lupine, and Sage Wolf. You can find our homeschooling, homesteading family on Instagram (@lusa_mama) an a behind-the-scenes look at our business as well (@lusa_organics). Or follow along on my blog where I talk about herbal remedies, peaceful parenting, and embracing imperfection. Rachel: It only seems fitting that a business that takes its name from our kids should grow up right along with them! With this constant evolution in mind, each month a new product makes its way onto the scene - from products for teen and adult facial care, to products for general well being (like our newly released Magnesium Mist and Headache Balm). This season we’re especially smitten by our new Hygge gift collections. With each passing season I've become more passionate about herbs as well, and we've launched an abundance of new herbal products for nursing and postpartum moms, children, and the rest of the family. In addition, LüSa Organics is offering free shipping on an order of any size with coupon code YULE. And if you add a comment of “More Cheer!” to your order notes, we’ll throw in a free gift, handpicked just for you. Offers good through December 31, 2017. Thank you for the opportunity. Their products are gorgeous. Jan: We are in the thick of holiday making and selling. This is our 3rd holiday season in the new store and things continue to grow and evolve! If you are ever in Ithaca, please stop by for a visit. One fun addition to the Silk Oak family is our new stickers. For those that love the images but don’t want to wear them, these are ideal. They are made of a heavier material so they hold up to wear on water bottles, lunch boxes and laptops. As always, it is a challenge to continue to find high quality garments to print on that are made in the U.S. This has been a hard year, with one of our major suppliers going out of business but, we are happy to have found some wonderful new things to replace them. In the coming year, be on the lookout for new items that we will be sewing right here in Ithaca! Wishing a joyful season to all. In addition, Silk Oak is offering 15% off with the code SOULEMAMA through December 17th. Beautiful desings, I would be happy to win this. Thank you for the chance. Fabula Nebulae is a family collaboration nestled in the woods of Maine. This time of year, we find ourselves quietly turning into little elves, mixing, pouring, packing, and whistling while we work to bring you and your family simple, effective, & completely awesome natural skincare. Though we love to be silly, we are serious about what goes into our products. We go to great care to ensure that our recipes are researched well, are safe, and actually work! Then we send them out to testers (sign up to be part of the crew!) to be sure that you love them as much as we hope you will. Come visit Fabula Nebulae on Instagram & Facebook. Pasaka: There are new products, new bundles, and cooperation with new friends! We’re so thankful to our testers for trying our creations and giving such constructive feedback, and so very excited about several new products with activated charcoal: our (bright citrus scented) charcoal sugar scrub, Eclipse, and a new Magnesium and Charcoal deodorant for sensitive skin coming soon! We’ve also got lots of gifts, both big and small, bundled together for easy sharing. The gift box pictured above is a connection with another community so important to our family - the Wild + Free homeschooling movement; all proceeds go to support the farm village they are building. And we’ve paired up with Enamel Co to bring you these beautiful camping mugs. As the days grow short and cold where we live, we tend to gather together and huddle closer. With every package we pack, every note we write, every correspondence we read, there’s the added joy of connecting to the real person behind the order or the words written. It’s been lovely to see a little community grow around our venture as the business grows! It warms our hearts, feeds our souls, and we are so very grateful for it! a $75 digital gift certificate. In addition, Fabula Nebulae would like to offer SouleMama readers 15% off through December 17 with the code GATHER, and every order placed this weekend will receive a sample of a new product! Browse our 2017-2018 Lookbook for 200 pages of inspiring and thoughtful gifts, our largest collection yet! We’ve spent the last ten years combing the globe for unique heirloom quality toys, tools, games, and craft projects, many of which are $25 or less. We hope you enjoy it as much as we do! Sarah: It’s been busy over at Imagine Childhood. We've been getting the shop ready for the holiday season and growing our Imagine Childhood family to boot! First with grandchildren (one a year ago and one coming any day now) and also in the form of lovely brand ambassadors and affiliates. It's been such a joy to watch how families and their sweet kiddos use our toys and tools for amazing adventures! If you have a brood of lively explorers and would like to join the family, send us a line, we'd love to meet you! a $100 gift certificate to the Imagine Childhood shop, a signed copy of our book, and a handmade Christmas Rose Fairy (pictured above)! In addition, Imagine Childhood is offering 10% off all orders placed between now and December 6th, as well as free shipping for orders over $100. Use code "soulemama" at checkout. Discount expires 12/6/17. Oh my goodness, where did this week go? It can't be Friday, can it? And December, at that! Ah! I've promised the kiddos we'll get our tree on Sunday and I'm so excited to make that happen. I'm still trying to convince them that searching for one in the woods would be fun, but we might just end up going to a farm to get a nice and pretty perfect one. That's fine too, so long as my crew is all together!